One hour before sunset in late July. 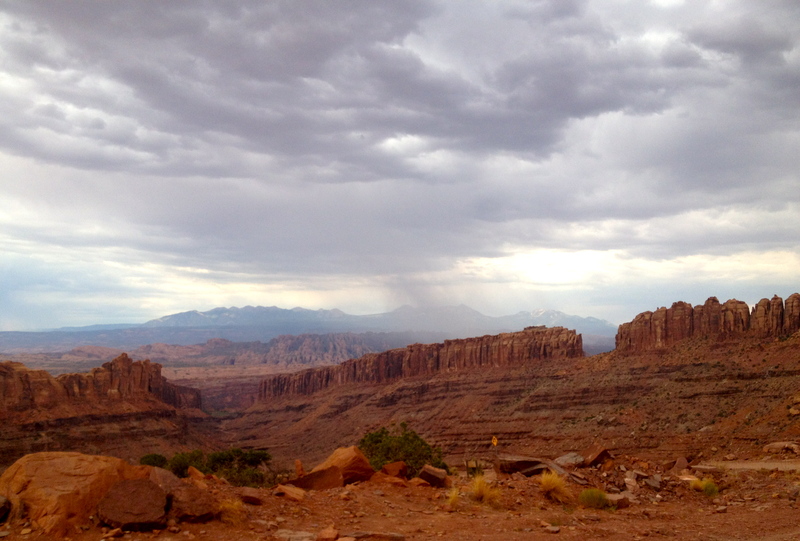 Gray’s Pasture, Island in the Sky, Canyonlands NP, Utah. MONSOON. The word conjures up images of driving sheets of heavy rain pummeling a coastal village, causing widespread flooding and general misery. Here in southern Utah, however, monsoons take a different approach. 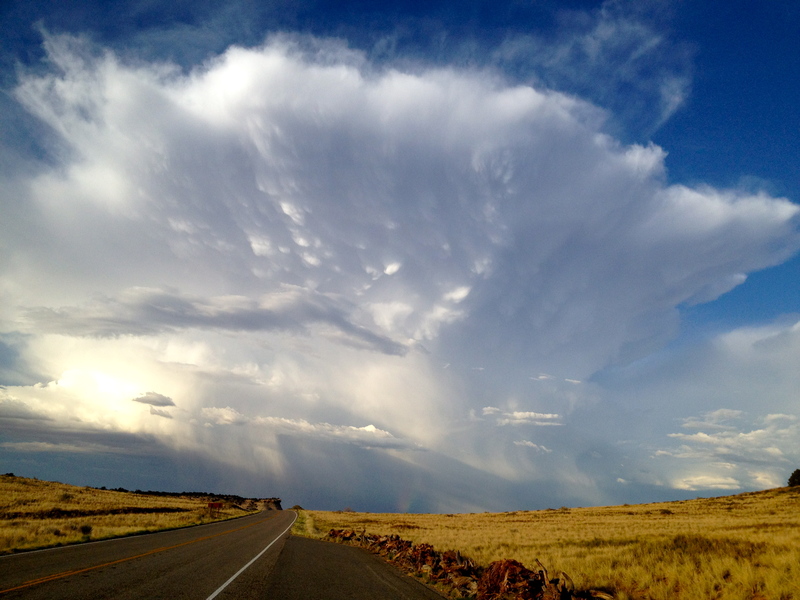 July, August, September are our months when thunderclouds can kick up, lightning arrives to make mesa-top living more interesting (and dangerous), and the clouds drape themselves in our skies like no other season of the year. We rangers love monsoon season. En route to a few hours of rock climbing near Moab, Ranger Bobby agreed to take us down a 4WD road the back way. 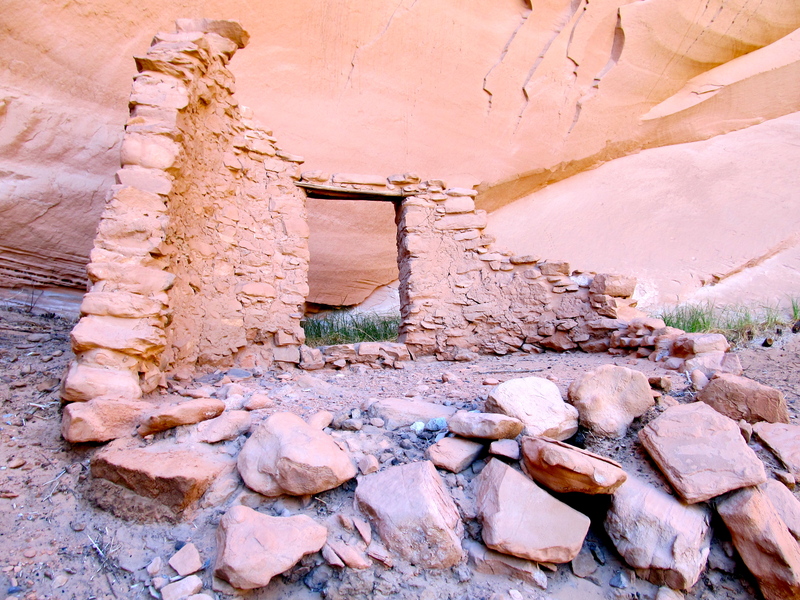 The views in Long Canyon were stunning, and reminded me why off-the-beaten-path is nearly always my first choice. Robert Frost’s poem welled up from cob-webby memory. Today, try a new route to work or home, okay? 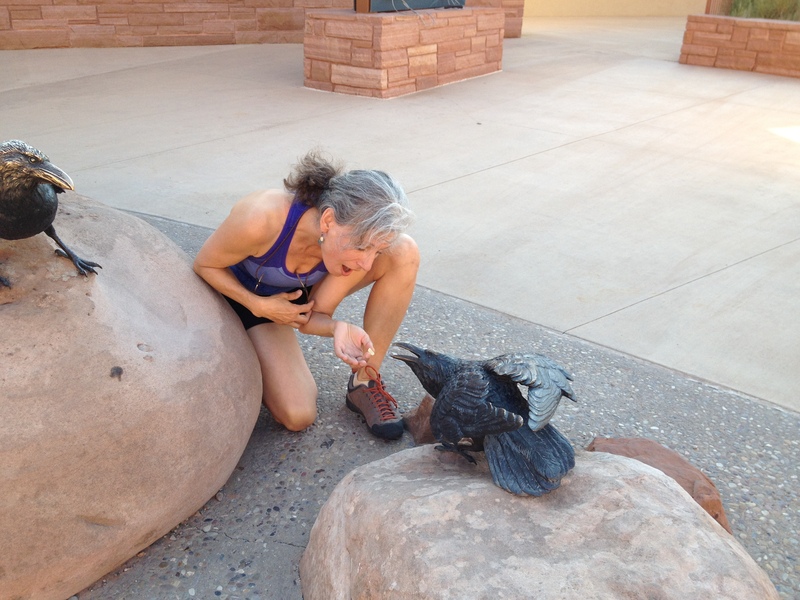 This BRONZE raven pair is getting “fed” a macadamia nut — a spoof by Ranger Kathryn. There are some things that really irk park rangers — typically encompassing behaviors that everyone knows are inappropriate, yet which continue to happen. Graffiti comes to mind as an intentional destructive act that disrupts natural beauty and creates extra work for the rangers who must remove it. Its perpetrators do not stop to think of the lasting damage as they carve their initials (or, for lunacy bonus points, their full name) into a tree trunk or rock face. Graffiti bothers me on a visceral level because it so rudely invades my wilderness experience. Today, however, we’re going for something more subtle — more excusable, according to its practitioners. It involves human food given to vertebrate recipients. Guilt-assuaging deceptive thoughts like “It won’t hurt a thing,” “I hate wasting food,” “Just this once,” “He looks hungry,” “It’s only a photo op,” or “It’s the kind of food he’d eat in nature” pave the way down this slippery slope. 1. It’s illegal in many places (and all national parks/monuments) to feed wildlife. 2. Wild animals have specialized diets and can die from the wrong foods. 4. Providing an artificial food source can cause adults to produce large families which the natural food supply can’t support. 5. You always risk injury when you do not keep a respectful distance from animals who may misinterpret your actions. I’ve an idea what you can do instead: create natural habitat that invites animals to live closer to you. Plant trees or shrubs for cover. Set out a birdbath. Add butterfly- or hummingbird-attracting flowers to your garden. And keep a pair of binoculars near the window; wildlife is best observed on their own terms. Thanks to ‘Wildlife Care of Ventura County’ for some of the ideas listed above. Early morning light reflects my hiking partners in Tsegi Canyon. Our steady gait will get us to the finish of our Keet Seel adventure by noon. Pre-dawn rustlings in camp signaled everyone’s eagerness to hit the trail before the sun warmed things up. Feet wiggled into boots. Bagels with peanut butter satisfied stomachs, fueling another 8.5 mile hike before climbing the switchbacks out of the canyon. We’re traveling lighter now: less food, less water, more joy. (Joy, you must know, subtracts weight from backpacks.) Tired hips and shoulders and feet from yesterday were doing fine after a night of so-called ‘rest.’ We set out southward. As each mile marker came into sight and faded behind us, our packs became simply an extension of ourselves, tightly strapped to our able bodies; at some point I ceased noticing mine. Several waterfalls burbled, singing to us of the millennium of habitation here. Two ravens overhead, mated for life, reminded me of the power of relationship. Algae-covered rocks spoke of the perennial stream’s life-giving presence. 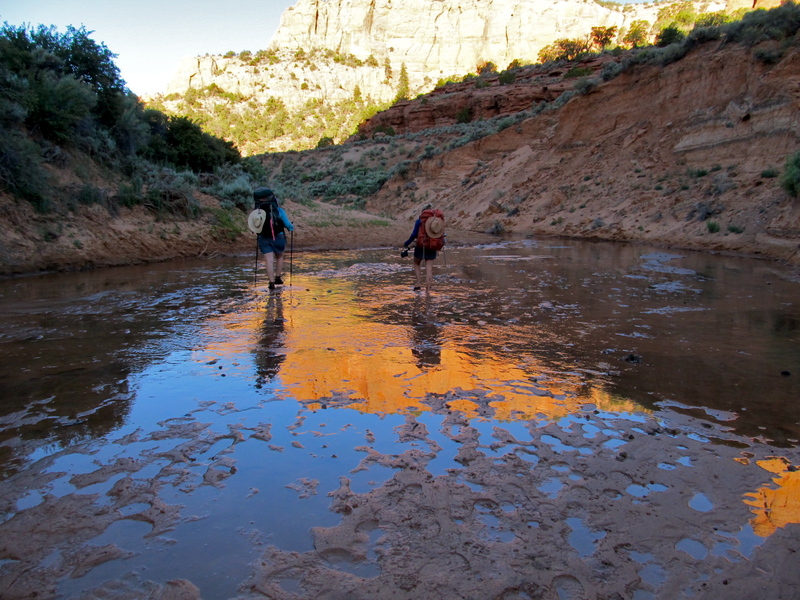 Before we knew it, the base of the switchbacks and my two liters of cached water appeared. We forced ourselves to drink, knowing what lay ahead. Like rabbits scurrying from shrub to shrub, we hastened from one spot of shade to the next during our thousand-foot ascent. And then we were out. Done. Celebrating the completion of a much-dreamed-of adventure to explore a long-absent culture in another state. Learning, in the process, what we’re made of, and why we undertake such crazy things: for the sheer delight of discovery, connection, exploration. Good-bye, Keet Seel. Your walls, streets, pottery, and art will always resound in my soul.